You may or may not have heard about the new health trend – drinking bone broth. While it sounds odd or even creepy, it’s actually one of the most nutritious foods you can consume. It’s been said that a nourishing pot of bone broth could bring back the dead! So, you might be wondering, what exactly is this stuff and why is it so beneficial? How do I make it or where can I purchase it? How do I cook with it? Look no further and read on! Our ancestors were wise. 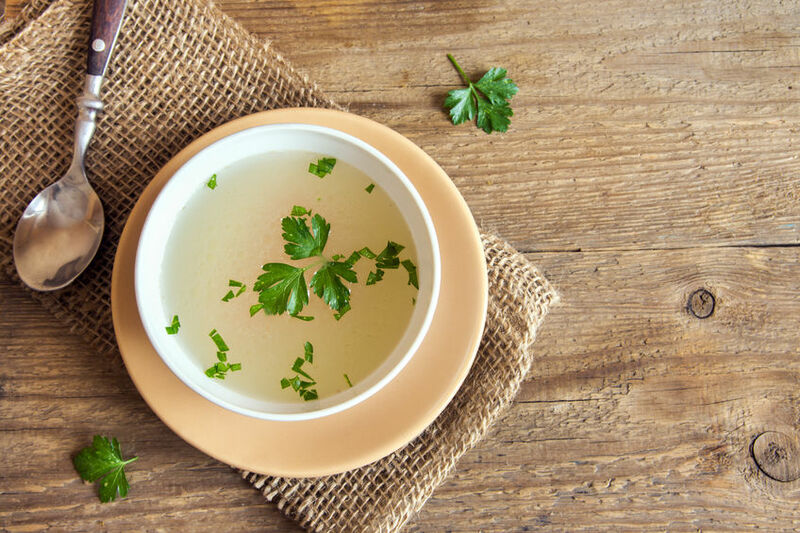 Homemade bone broth, or stock, as it is commonly known, has been a quintessential part of traditional cuisine for centuries. However, while many societies continue to make bone broth by slow-cooking bones, Americans somehow lost that tradition somewhere in the early 1900’s when scientists discovered that meat flavors could be mimicked in laboratories and made with inexpensive and poor quality ingredients. So most Americans opt for flash-made, MSG-infiltrated boxes of broth alternatives found at the grocery store. These synthetic products rob consumers of the rich organic flavor of homemade broth along with the nourishing benefits it has to offer. Boxed (or canned) broths, even if organic, are not fresh. While they may be helpful in a pinch for a recipe, they not only are diluted, but they contain additives and added sugars and/or GMOs (genetically modified organisms). Learning to make bone broth is not so complicated. As long as you have a slow cooker, it’s actually very simple! It’s made by slowly cooking together bones, some pieces of meat, vegetables and filtered water for an extended period of time. Our ancestors appreciated every animal that was slaughtered; and, in an effort to show their gratitude towards those animals, they were sure to consume and/or utilize every part of the animal … right down to the bones. Homemade bone broth offers minerals in a form that the body can easily absorb such as calcium, magnesium, phosphorus and trace minerals. Have you ever heard of the expensive supplement, glucosamine, for easing arthritis or joint pain? The cartilage and tendons from animal bones are transferred into the liquid while cooking, rendering a glucosamine-rich broth. Additionally, the most nourishing component of bone broth is gelatin, which has been used to heal and nourish people for thousands of years. I love how Katja Heino, of Savory Lotus, explains that gelatin is a superfood which delivers so many benefits. Gelatin improves digestion, as well as hair, skin and nails. It speeds up the healing of wounds, enhances the quality of sleep, and helps with weight loss. In fact, the presence of gelatin is why bone broth is healing on so many levels. A simple google search of bone broth recipes will provide you with a variety of recipes to choose from by food bloggers. It all depends on what bones you have on hand and how flavorful you want your broth to be. Most importantly, it is crucial to use bones from organic or grass-fed animals. This means avoiding bones from conventional meats so that toxins are not released into your bone broth while cooking. You can find higher quality bones at your local butcher (ask to be sure that they carry organic or pasture-raised meats) or Whole Foods Market. Inquire at a local farm in your area about these meat products, and network with farmers near you or visit your local farmers’ market. Be sure to add chicken feet (1-2 feet per batch purchased from a local farm), knuckle, neck and/or wing bones, or meaty rib bones to create a rich broth full of glucosamine, collagen and trace minerals. These ingredients are composed of connective tissue and joints, after all. For time-saving meal planning, line up a few plastic freezer bags and portion out the bones. You can even add fresh veggies and herbs right to the bags, seal them up and label, “Bones to be Cooked for Bone Broth.” Include the date and store in the freezer for the next time you need to cook some up in your slow cooker. Below is a very basic, mild (tasting) bone broth. If you have some extra vegetables in the house, feel free to throw them in the mix! For example, along with the bones, add 5-7 smashed garlic cloves, an onion sliced in half, some celery stalks or carrot sticks, a teaspoon of black peppercorns, a few bay leaves, or add a handful of fresh herbs as parsley, thyme or oregano to your slow cooker. Experiment with each batch until you find the flavor that you enjoy. Fill your slow cooker with bones (about 2 – 3 lbs) from organic or pasture-raised animals. (An organic chicken carcass will do in a pinch!) Top with filtered water. Add 1 Tbs. raw apple cider vinegar (you can’t skip this step). Cook on low heat for 24 hours (up to 48 for beef bones). Let cool and remove/strain bones. Add sea salt to taste and store in refrigerator for up to a week or freeze in freezer safe containers (or ice cube trays) for later use. If refrigerating, a layer of fat usually forms on top of the container. This is a healthy fat, so skim and use it for cooking. If you want some bone broth to add to your smoothies, skip the salt. Smoothie ice cubes add nutrition to your shake! These products are sold at your local health food store, Whole Foods Market, Thrive Market (online), or on Amazon.com. If you’re in the New York City area, pop into one of the two Brodo locations, where you can order a hot, fresh cup of the most delicious bone broth to go! Whether you cooked it yourself or bought it pre-made, it’s time to actually consume some nourishing bone broth. Simply boil some bone broth and pour into a mug or to-go coffee cup/container and sip as you would coffee or tea. Sometimes it’s nice to add a bit more flavor to your cup-o-broth with a pinch of sea salt, a ⅛ of a teaspoon of ghee, or a ¼ – ½ teaspoon of miso paste. For soups or stews, substitute bone broth for regular broth, bouillon, or stock. When cooking grains such as rice, quinoa or even pasta, use bone broth for added flavor and nutrition. Add some bone broth into tomato-based sauces or dishes, such as marinara sauce or chili. Instead of adding water or milk to your morning eggs, add a splash of bone broth instead. Do the same with mashed potatoes by replacing milk with bone broth for a creamy texture. If you poured your bone broth into ice cube trays, use a few frozen cubes to sauté or boil vegetables. In the summer, adding a cube to your smoothie is an easy way to get in your bone broth without even knowing it’s there! The flavors from the rest of the ingredients in your shake usually will mask its savory flavor. However you choose to enjoy bone broth, doing so will provide you with an excellent source of wholesome nutritional benefits. Here’s to your health!